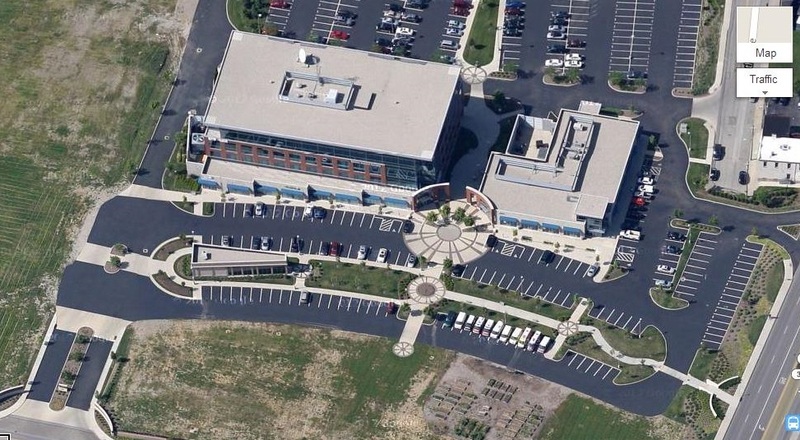 Paycor recently moved their headquarters from Queensgate to Norwood’s Linden Pointe on the Lateral. Norwood pulled out all of the stops to ensure that they brought these jobs (and the tax dollars that come with them) from the City of Cincinnati. When moving into their new digs, employees were literally crying out of excitement for their new workspaces. The open design and floor-to-ceiling windows are complimented by walking routes that allow employees to walk the perimeter of the floors for exercise. However, once they step foot outside the front door the only thing any Paycor employees will be walking to are their cars. Let’s back up though; the first phase of Linden Pointe actually had some great features. From sidewalks, crosswalks and bike parking, this development was well thought-out (other than the buildings being so far off-set from the street). The Paycor development has absolutely no resemblance to the relatively pedestrian-friendly phase one. There are no sidewalks connecting the Paycor building to any local roads. Bike parking is also seemingly non-existent. But the biggest slap in the face to good design is Paycor’s complete disregard of the crosswalks already built in phase one towards the new development. Instead of leading to a tree-lined sidewalk that runs to Paycor’s front door, these crosswalks lead to nowhere, seeming to indicate deliberate decisions taken by Paycor to avoid connecting their site to the rest of the development. We can’t just blame Paycor for this mess though. Norwood’s Planning Commission & City Council approved the site plans too. The plan shows the crosswalks from the original development leading nowhere. The plan also shows no sidewalks connecting Paycor to any of the three nearby streets. The plan does show a nice shiny building that will house lots of additional revenue. It is likely the City of Norwood did not want to push back too hard because the Paycor move was likely not a done deal. This is a shame though, because a better design would have benefited the surrounding neighborhoods and Linden Pointe as a whole by allowing for a comprehensively connected center instead of disjointed cul-de-sac style parcels. James Bonsall recently moved, with his wife, to Norwood from New Albany, Indiana. In New Albany James served on the city’s planning commission. He has a B.S. in Business from Indiana University and currently works as an IT business analyst for a major health insurance company. You can connect with James on Twitter at @LouisvilleJames.